First of all, gorgeous cover, right? I am obsessed with this cover - I'd probably read a lot more historical fiction if all the covers looked this good. The story itself is pretty intriguing as well. 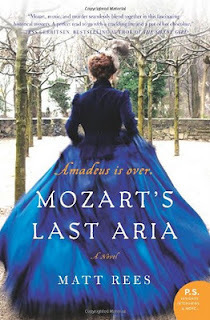 Mozart's sister, Nannerl, herself an acclaimed musician, investigates her suspicions of Mozart's untimely death and discovers disturbing connections to a conspiracy involving Austrian royalty, secret police, and the freemasons. Excellent writing. I think the author did a great job of achieving his objectives in this story. It is perfect historical fiction - nothing too flowery or any obvious attempts at being literary fiction, but also not too light and fluffy. It's also very well researched. Rees includes an appendix with a listing of the music that is mentioned throughout the book as well as an explanation of K numbers and how to find the music. I found this especially interesting and used it to listen to the music I was reading about as I read. Rees does an excellent job of conveying a sense of Mozart's music through his writing. I also enjoyed his editorial notes at the end on which parts of the book are historically accurate and which were embellished. Overall, I was very impressed. It's a mystery involving Masons - so what's not to love? Secret societies fascinate me and Rees does a great job of delivering suspense. I also loved the inclusion of classical music throughout the book, although I don't think being a classical music fan is a requirement for enjoying this one. It may even motivate you to give it a try. I also enjoyed reading about Nannerl and learning some of the history of the time period. It's a great mystery and kept me up late at night finding out who killed Mozart and why. I highly recommend this one. This one was graciously sent to me by TLC Book Tours and you can find a list of the rest of the tour participants here. I have been unsure about this one. I do love Austria and I have visited Mozart's home, so that gives me a little background that interests me, but overall I haven't had a desire to learn more about Mozart and his life, nor do I like classical music. This sounds like something I'd really enjoy. This one definitely seems like it's right down my alley! I love learning actual facts when I read historical fiction, so I would love the editorial notes at the end! So glad you liked the book. Thanks for being on the tour! I have had my eye on this book for awhile- the cover is captivating. I love the idea that the music is referenced - because I think I would have to listen to those songs as we go. Thanks for the reivew.